WHAT DOES GOD EXPECT FROM ME, ANYWAY? Modern religion has attempted to make Christianity “user -friendly” by taking a marketing approach to recruiting new members. Popular TV preachers make it a matter of policy to never use the “S” word — sin. Churches openly trumpet a “come as you are” approach (and they both mean casual lifestyle and casual dress). Today’s pulpit mutes repentance and trumpets self-esteem. Hell is old-fashioned. Feel good is in; life-change is out. God is made in man’s image. Jesus took a different approach. His religion is high stakes: “In the same way, any of you who does not give up everything he has cannot be my disciple” (Luke 14:33). Christ was up front with people. He put nothing in the fine-print — hid no “gotcha clauses” to be discovered later. He said simply: “If anyone will come after me, he must deny himself and take up his cross daily and follow me. For whoever wants to save his life will lose it, but whoever loses his life for Me will save it” (Luke 9:23-24). At the same time, He gives us an incredible offer. He promises to help us! We can do all things through Christ Who gives us strength (Phil. 4:13). The good news is not that if we straighten ourselves up we will be saved — that would be bad news, since we cannot do that (Eph. 2:9). The good news is that Jesus enables us to become like Him (Phil 2:12-13). His power manifested through His Word, works in us and gives strength to accomplish all He asks of us (Eph. 3:14-19; 6:17). IF ANY WILL COME AFTER ME. Jesus’ invitation is both voluntary and universal. He forces no one to be His follower. His is an all-volunteer army (Mt. 11:28-30). The requirements are universal. No exceptions. No favors. No waivers. We cannot stay where we are and go with God at the same time. What adjustments may be required? We may have to change our thinking. If we have a job inconsistent with Christian principles, we must look for new employment. If money is too important to us, we must do as Jesus suggested to the rich young ruler (Luke 18:18-27). We may have to change relationships. If a relative forbids true religion, we must chose Christ (1 Cor. 7:15). If friends constantly tempt us to sin, we must find new friends (1 Cor. 15:33; Mark 14:54-72). Unholy and forbidden relationships must be severed (Gal. 5:19-21; 2 Cor. 6:14). We may have to change commitments. If we are spread too thin to worship God and to do our part in building His kingdom, we need to take irons from the fire (Eph. 5:16; Heb. 10:25). LET HIM DENY HIMSELF. Self is best defined as an individual’s own welfare, interests, advancement, and agenda. To deny self then is to refuse to fulfill personal interests ahead of others or manipulate others to our own advantage. Denying self literally means “to turn one’s self off”. TAKE UP YOUR CROSS. 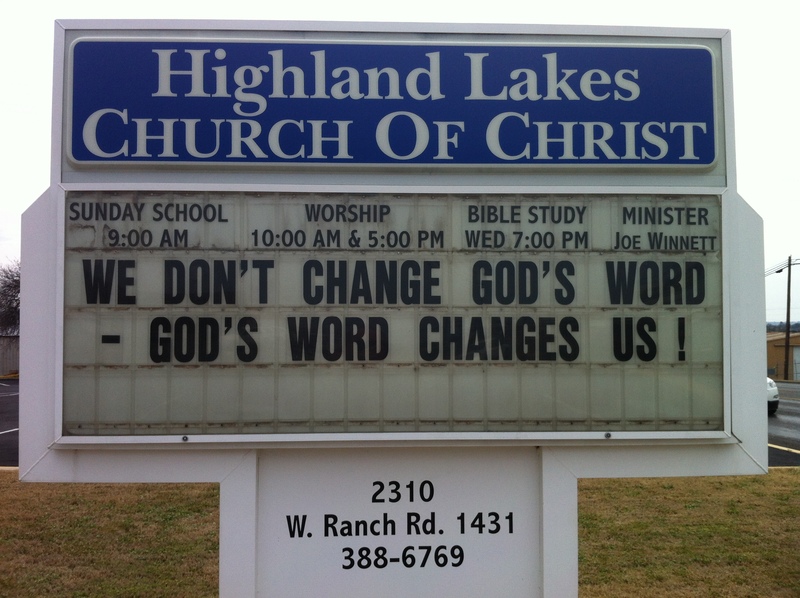 A strange thing to say in Jesus’ time! Today we might say, “To follow Jesus, take a seat in the electric chair.” The cross, crucifixion, was shameful in Jesus’ time. With the beam tied across his shoulders, the prisoner was spit upon, mocked and hit with things. It was painful. Are we willing to take up our cross daily? AND FOLLOW ME. This statement of Jesus is recorded eighteen times in the Bible. It means commitment, it means sacrifice, denying one’s self. Some might venture that Jesus’ approach will never work, so it is not done. But it needs no improvement, only to be taught. It needs no marketing, only practicing.